This 1976 photo shows Postmaster General Benjamin F. Bailar presenting the Adolph Ochs stamps to Ochs' daughter, Iphigene Ochs Sulzberger, and her four children, Judith P. Sulzberger, Arthur Ochs Sulzberger, Ruth S. Holmberg, and Marian S. Heiskell. The famous newspaperman Adolph Ochs was born on March 12, 1858, in Cleveland, Ohio. 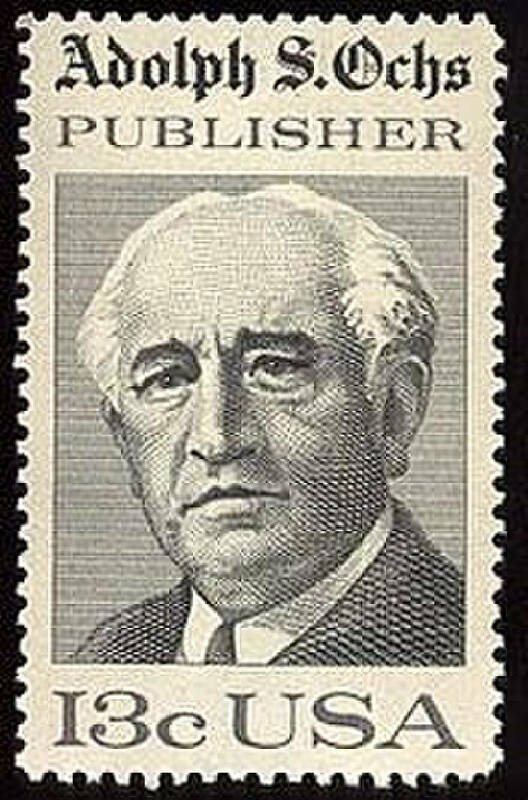 His parents, Julian and Bertha Levy Ochs, were natives of Bavaria. The family was living in Knoxville when their son began his newspaper career delivering papers for the Chronicle at the age of 11. In 1870 he worked in an uncle's store in Providence, Rhode Island, and attended Warner's Business School at night. A year later he returned to Knoxville and worked as a printer's devil on the Chronicle. He then went to Louisville where he worked as an apprentice for the Courier-Journal and returned to Knoxville where he held several jobs on the Tribune. Ochs was only 19 when he moved to Chattanooga in 1877. He soon became editor of the Daily Dispatch, and in 1878 printed a directory of Chattanooga. The Dispatch having failed, he arranged its consolidation with The Chattanooga Times, gaining control of both papers on July 1, 1878, when he was only 20. On Feb. 28, 1883, in Cincinnati he married Effie Miriam Wise, daughter of Rabbi Isaac M. Wise. The newlyweds went by train to Washington, D.C., where Ochs had arranged for them to have tea with President Chester A. Arthur. Their daughter Iphigene was born on Sept. 19, 1892. Ochs' new six-story Times building of Italian Renaissance design surmounted by a golden dome was dedicated almost three months later, on Dec. 8, 1892. Located at the corner of Georgia Avenue and East Eighth Street, it was the tallest structure in Chattanooga. More than 10,000 people attended the dedication. A group of local citizens presented him with an 8-foot tall grandfather clock, which he later moved to his New York office. After falling heavily in debt during the Panic of 1893, Ochs hoped to dig his way out by acquiring another newspaper. His chance came on March 17, 1896, when a reporter for The New York Times notified him by telegram that the newspaper, in a slide towards bankruptcy, was for sale. On Aug. 18, 1896, Ochs gained control of the paper, which is still controlled by his descendants. Ochs added the Times' well-known motto, "All the News That's Fit to Print." In 1904 he moved the paper to a new building on Longacre Square in Manhattan, which the city renamed Times Square. On New Year's Eve 1904, Ochs had pyrotechnists illuminate his new building at One Times Square with a fireworks show from street level. In 1928 Ochs built the Mizpah Congregation Temple in Chattanooga in memory of his parents. In 1979 it was designated as a Tennessee Historical Preservation site. He fought anti-Semitism and was active in the early years of the Anti-Defamation League. He died on April 8, 1935, during a visit to Chattanooga and is buried at the Temple Israel Cemetery in Hastings-on-Hudson, New York. His daughter Iphigene had married Arthur Hays Sulzberger who succeeded Ochs as publisher of The Times after Adolph died. He was succeeded by her son-in-law Orvil Dryfoos (1961-63) followed by her son, Arthur Ochs "Punch" Sulzberger ,and then by her great-grandson Arthur Ochs Sulzberger Jr. (1992-2017). He was succeeded by his son, A.G. Sulzberger, on Jan. 1, 2018. Preparing for the transition, A.G. Sulzberger referred to Adolph Och's request in his will that his descendants maintain the editorial independence and integrity of The Times. "I think that's something everyone in my family feels, which I suspect I feel particularly acutely, given this pretty profound responsibility," A.G. Sulzberger said when his appointment was announced. In Chattanooga, Iphigene's daughter, Ruth Holmberg, became publisher of The Chattanooga Times and served for 28 years (1964-1992). She was chairwoman of the Times Printing Co. from 1992 to 1999. In 1999, The Chattanooga Times and the Chattanooga Free Press were merged into the Chattanooga Times Free Press. Like her grandfather Adolph, who worked to establish the Chickamauga and Chattanooga National Military Park and to preserve much of Lookout Mountain, Ruth was very civic-minded. In 2001 she and her husband, William Holmberg, funded artist Jim Collins' stainless steel book sculpture and fountain titled "Volumes" outside the Chattanooga Public Library. William Holmberg died in 2005, followed by his wife Ruth in 2017 at the age of 96. In 2005 both were honored for their support of the arts with the construction of the Holmberg Bridge, a $1.6 million pedestrian bridge leading from the Hunter Museum across Riverfront Parkway to the Walnut Street Bridge Plaza. Kay Baker Gaston is a regional historian and a former Chattanoogan. For more, visit chattahistoricalassn.org.